This appeared first as Queries and Answers 15. 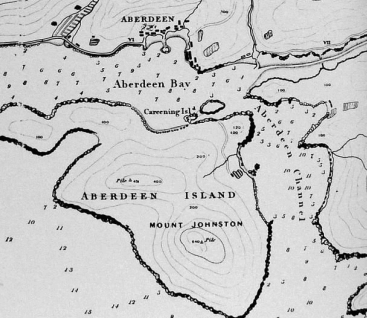 Hugh Farmer: While walking around Aberdeen last week I saw an information board that said, “the name Shek Pai Wan meant a bay packed with rows of stone”. Shek Pai Wan is Aberdeen harbour ie the water between Aberdeen and Ap Lei Chau. Thomas Ngan responded to my query: The term Shek Pai (石排) in this case is usually referring to some block of submerged rocks, which is very likely only visible and reacheable at low tide, usually hazardous to shipping. Thomas Ngan added: You might like to refer to this old map. A rock feature had been marked there on the shore. 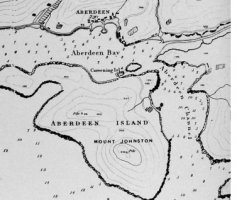 Section of “(1845) The 4 inch ‘Collinson’ Map (reduced).”, shown in Plate 2-1 of the “Mapping Hong Kong – A Historical Atlas”, by Hal Empson. This article was first posted on 12th February 2014. Yes. The name is because of the landscape shek pai 石排 there but not the quarry. The map shows the landmark “shek pui” for navigation. The rock in Aberdeen and Pokfulam is volcanic rock 火山岩 but not granite 花崗岩. Only granite is used for building which can be found in quarries in Lei Yue Mun, Castle Peak and Saukeiwan. Piers were constructed in the quarries (e.g. the remain of the piers in LYM) for transportation. It is not necessary to transport the granite stones to the fishing harbour Aberdeen first. It is foolish way and is not logic la.